To use Localist Register, select Tickets & Registration then check off User Localist Register within your event form. Register was built from the ground up with security in mind. Register is PCI-DSS 3.2 Level 1 compliant and utilizes Stripe, an industry standard payment processing system. The following settings are for the entire platform and will be applied to every ticket made available to your audience. This portion of Register is only accessible to Platform Admins by navigating to Settings > Register. Require Account to Register: If unchecked, your audience will be able to register and purchase tickets without logging into the platform first. Payout Accounts are added through Stripe by selecting +Add Payout Account. Operating Currency: USD is the default, but you can switch the currency to any major international currency. Payout Accounts: This is the account that receives the proceeds from ticket sales. Questions added in this section are automatically added to every event. You can specify whether an answer is optional or not. Keep in mind, the more required questions you require, the higher the chances are for your audience to abandon the ticket buying process. +Add Ticket Separator — This will create a separate list of tickets. 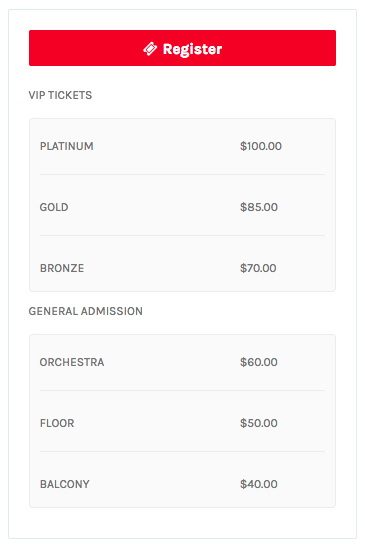 For example, you may create a Ticket for “VIP” options or “General Admission” options. The Separator Name will appear as a heading above the corresponding Ticket Group. Once a Ticket Group has been added, select +Add Ticket. Once the Ticket is added, you can drag the ticket listing under the appropriate Ticket Group heading. Active: If unchecked, this ticket option will no longer be available to your audience. Ticket Name: Easily identify various ticket kinds. Description: Let your audience know what kind of ticket they are purchasing. Price Type: “Fixed” is for admin-defined pricing while “User-Defined” allows for a donation specified by the end-user. Fees: The processing fee can either be passed onto the customer or absorbed by the organization. Price: Flexible pricing in USD (default) or currency defined by Platform Administrator. Custom Sale Dates: Define when the ticket will go on sale and when it will be taking off sale. Hidden: Ticket will not be visible unless a corresponding promo code is entered. Tickets Available: Set a maximum amount of tickets to be sold. Minimum Quantity Per Purchase: Lowest amount of tickets allowed to be sold per transaction. Maximum Quantity Per Purchase: Highest amount of tickets allowed to be sold per transaction. Promo Codes allow for your audience to redeem customized discounts on ticket purchases. To add, select +Add Promo Code. Active: If unchecked, this Promo Code will no longer be available to your audience. Code: This is free-text, which means it can be any combination of letters or numbers. Discount Type: Select Amount ($5 off) or Percent (5% off). Expires: Specify the last date this Promo Code can be used. Number of Uses: Specify a maximum number of Promo Code redemptions. Associated Tickets: Select the tickets this Promo Code can be used on. Attendee Questions are any question you’d like to ask your audience prior to them attending your event. These are defined on a per-event basis, not on a per-ticket basis. Question: This is free-text, which means you can enter any phrase you’d like. Require Response: You can specify whether an answer is optional or not. Keep in mind, the more required questions you require, the higher the chances are for your audience to abandon the ticket buying process. These are settings that are defined on a per-event basis, not on a per-ticket basis. Event Capacity: This is the overall number of all tickets that can be sold. Registration Notifications: If checked, the Event Owner will receive an email notification each time someone registers or purchases a ticket. Payout Account: This is the account that receives the proceeds from ticket sales. The platform’s default account will be automatically selected. If the payoff account you need is not listed, please contact a Platform Admin at your organization to see that it is added. Select which tickets and in what amount. These are custom per-event, but may be required for a user to complete. Enter a valid credit or debit card number, expiration date and CVC. The payment will be processed through Stripe. Our team of experts is here to not just do the heavy lifting during implementation, but to also kick your Support services up several notches so you can focus on curating and crafting quality event content. Enter your email address to connect with your Customer Success Manager.